Women in Norway who were born in the Middle East, or in North or Sub-Saharan Africa are more likely to be overweight or obese during early pregnancy, according to a new study. Katariina Laine, an obstetrician and researcher at the University of Oslo, noticed that obstetric patients from some immigrant groups seemed more likely to be overweight. “Overweight and obesity are associated with many complications during pregnancy and delivery,” she says, so she decided to investigate whether there really was a difference. To answer the question, Laine’s team turned to the Norwegian Birth Registry, which has demographic and health information from every pregnancy in the country since 1967. They combined this with data about maternal education level and country of origin from Statistics Norway to look for possible correlations between demographic factors and the prevalence of overweight and obesity in early pregnancy. Their analysis revealed that 22% of pregnant women were overweight and 12% were obese. Women born in Sub-Saharan Africa, the Middle East and North Africa (MENA) were more likely to be overweight or obese during pregnancy even when correcting for education level or urban versus rural residence, which were also linked with overweight prevalence. These findings are in line with a 2013 study of older women who weren’t pregnant. “So it seems there’s a pattern for MENA women living in Norway,” says Laine. Genetics or patterns established during childhood, such as dietary habits and low activity levels, could be responsible, though Laine stresses that this study offers no insight into causes. 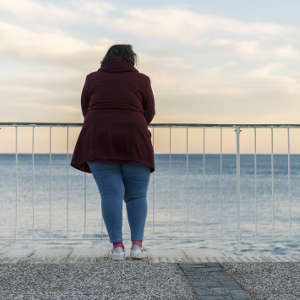 Given the risk of complications or even stillbirths, the researchers recommend that public health services focus on helping women in these at-risk groups avoid obesity.